A recent article on CNNMoney cites Twitter’s lack of user growth as a reason for a recent decline in the company’s stock price. 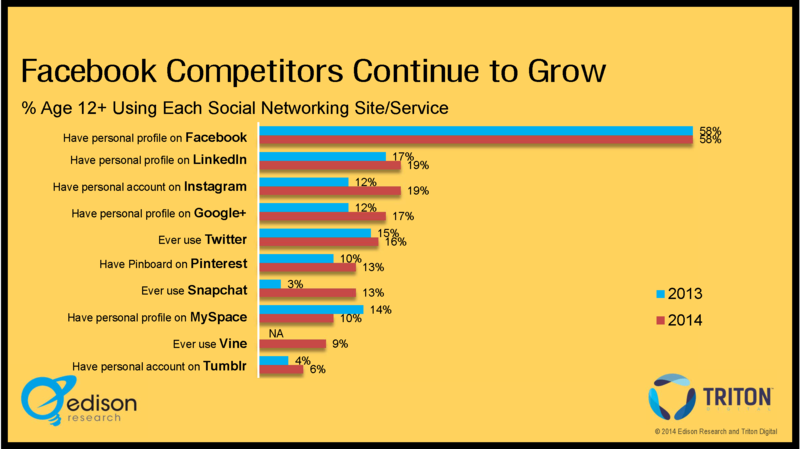 I decided to take a look at some recent data on the relative growth from 2013 to 2014 of the leading social networking sites and services, to see if the rumors of Twitter’s demise were exaggerated, or if the service did indeed have something to worry about. This data is based upon a representative sample of Americans 12+, is projectable to the U.S. population (methodology here), and it tells us a few things. First of all, Twitter’s growth has clearly slowed–and so has that of Facebook. The percentage of Americans who use Twitter rose from 15% to 16% last year, while Facebook’s growth appears to have stalled for the time being, remaining at 2013’s 58% figure. So on the one hand, Twitter did continue to add users, but one would hardly call that hockey stick growth. On the other hand, it has “slowed” to 16% of all Americans. For a single brand. If Twitter were a laundry detergent or a pet food, we’d be having a very different conversation. But it’s not pet food, and there are indeed some mixed signals in this graph. First of all, Twitter was the third most widely-used platform in 2013, behind Facebook (the aforementioned 58%) and LinkedIn (at 17% of Americans 12+.) This year, though they have grown, they have fallen to fifth in rank (hello, Instagram and Google+). In fact, without seeing the relative growth in other platforms, I might be inclined to be less concerned about Twitter’s modest increase in users. The space, however, is not slowing down–and there are some interesting similarities shared by the biggest gainers. Look at the services that showed marked year-over-year growth: Instagram, Pinterest, Snapchat, and Vine’s debut at 9%. The social networking space is showing signs of being an actual, you know, market, with a wider variety of players all developing significant user bases. These services have a couple of things in common, and these may be one key to Twitter’s fortunes. First of all, all of these newer, growing services are about sharing images (and let’s even throw Google+ in there, with its growing community of photographers and powerful image tools.) Clearly, as you’ve read here for some time on Convince and Convert, Visual Marketing is a thing. Remember that received wisdom that 80% of us were consumers, 19% curators, and 1% creators? Intagram, Snapchat, and Vine have thrown those ratios out the window, as long as we are comfortable with an evolution in what “creating content” means. There is a second thing these services have in common, however, and that’s this: they are designed around sharing experiences. While Twitter’s origins were centered around “what is happening,” these newer, mobile networks are based around “what are you doing?” And if I want to share what I am doing or experiencing, I am increasingly more likely to do that with 2-3 thumb presses than with 141 thumb presses. Note: I am not sounding Twitter’s death knell–that would be absurd. I am merely pointing out that these other services have found ways to tap into the behaviors and motivations of those of us who are not inclined to broadcast tweets, but are inclined to share experiences with other humans. Finding ways to tap into those behaviors might be a key to continued growth for Twitter. And you know, it might not be a bad idea for your brand, either.